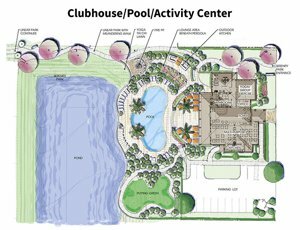 The Serenity Reserve active adult neighborhood is an active adult community just South of Lake Nona in the Narcoossee area of Saint Cloud. This gated, 28 acre neighborhood offers resort lifestyle living in a quiet area but just minutes from World class attractions, sports, shopping, dining and medical facilities. Residents also enjoy a maintenance free lifestyle as the HOA takes care of all lawn, landscaping, irrigation and pest control at your home as well as the common areas. Large Resort Style Pool overlooking a pond and shaded with tropical palm trees. Plus.... Serenity Reserve has a both home meal delivery options from the clubhouse AND a Chef on Call Service which will allow residents to have a chef prepare gourmet dinners which you can take home or have delivered. There will also be regular theme dinner nights such as Italian or Mexican nights served at the dining and meeting room in the clubhouse. The chef will also offer regular cooking classes for residents. Where is Serenity Reserve in Saint Cloud? 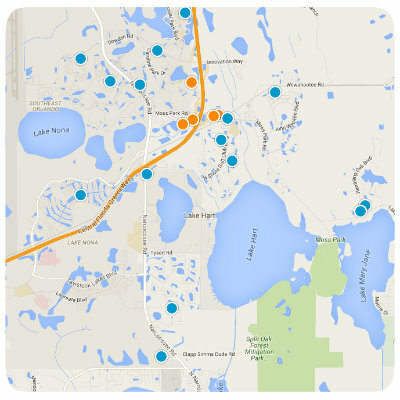 Serenity Reserve is located just South of the booming Lake Nona area, off Thompkins Drive & Narcoossee Road. You have multiple grocery, shopping and restaurant options located just outside the neighborhood within the Narcoossee area or in the Saint Clouds or Lake Nona areas on either side of Narcoossee. Hwy 192, The 408 Expressway, and the Florida Turnpike are all a short distance away, making getting around Central Florida quick and easy. Homes in Serenity Reserve are being built by Bellavista Building Group. 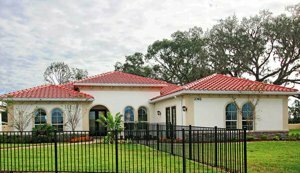 This residential builder has over two decades of experience in Central Florida. There are four models available within the neighborhood which come with multiple elevation options. Homes can be modified to an extent to meet your specific needs. Homes range in size from 2200 sq ft, 3 bedroom homes to 3500 sq ft 4 bedroom homes. All home feature loads of upgrades including Spanish concrete barrel tile roofs, 12 foot high ceilings in all living areas, two master suites in every home, full bath attached to every bathroom, granite countertops in all baths and kitchen, brick pavered driveways, wide home lots, and energy efficient appliances and home designs.